I watched the new cinematic piece by Darren Aronofsky one week ago, but I couldn’t bring myself to write about it until now. That is because this movie is very controversial. But not in the way many people think of it – religious VS artistic interpretation. I hesitated because I didn’t want to be disappointed that much when writing about it. I wanted to think about what I saw and then write about its form and substance. 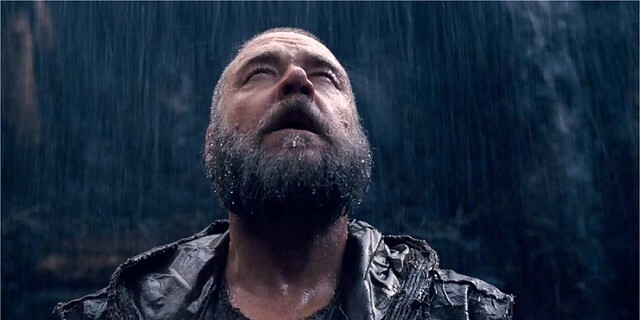 The new heroic journey of Mr. Russell Crowe and his team of dramatic experts – Jennifer Connelly, Anthony Hopkins, Ray Winstone and Emma Watson – is rather epic, but it doesn’t show us many new thoughts on this piece from The Old Testament. And we didn’t see much character development in most of the actors in it. Yes, Russell Crow is rather impressive, but I expected something new, a beam of light to shine through the silver screen, as it did before when I watched Aronofsky’s previous movies (“The Black Swan”, “The Fountain”, “Pi” or “Requiem for a dream”). I felt enormous anticipation for something more provocative and daring, something entirely new as a viewpoint. And I almost didn’t get it. I say almost – because during this week of delay, I weighed the performance of the main actors again. Yes, we didn’t get much of an enlightenment, but we saw at least four characters who were struggling with their inner demons as we humans do every single day. We can all feel in our hearts the sense of destiny that lies around us. We all connect to the thought that no matter what we do, our paths are destined to go only one way. But it is true also that we can shape our deeds according to our own will and choices. We model each step we take and we decide what we take as good and evil. Yes, our perception of these two change almost every day, but in the end, we know that it was our choice which shaped our destined path. Indeed we are all prone to explain to ourselves every mischief or every success with a higher power, but since ancient times we want to change and try to change the course of our lives. And we often do that. But all within the time limit which we have. Having this said I would like to express my gratitude for Russell Crow’s, Jennifer Connelly’s and Anthony Hopkins’ performance. They all did a very, very good job. And my general impression is that acting was very good. It was the script that didn’t feel too much innovative. But it is important to say that Aronofsky made a very watchable epic movie. He will not be remembered for it (compared to his previous masterpieces), but he will surely make some money for the studio. The sound and the special effects were very good – powerfully complementing the story. The makeup and the clothing did represent an era long forgotten. The artisans’ job seemed impressive indeed. In the end – we got what they prepared for us – a movie within the limits of the blockbuster screen writing, but with the potency of modern acting schooling.